All together vs. altogether: What’s the difference? Some words in English start out as two separate words (e.g., mail box) and fuse into a single word (e.g., mailbox) over time. Are all together and altogether another example of this linguistic phenomenon? Or are they actually distinct terms? Take a guess. Because we’re about to break down the difference between all together vs. altogether. When you’re thinking about the difference between all together vs. altogether, remember that all together means that people or things are coming together as a group. So now you know what all together means. But what about altogether? When you’re thinking about the difference between all together vs. altogether, remember that altogether means entirely or on balance. Altogether looks like it could be a modern version of all together. But it’s not. All together vs. altogether are two separate terms. 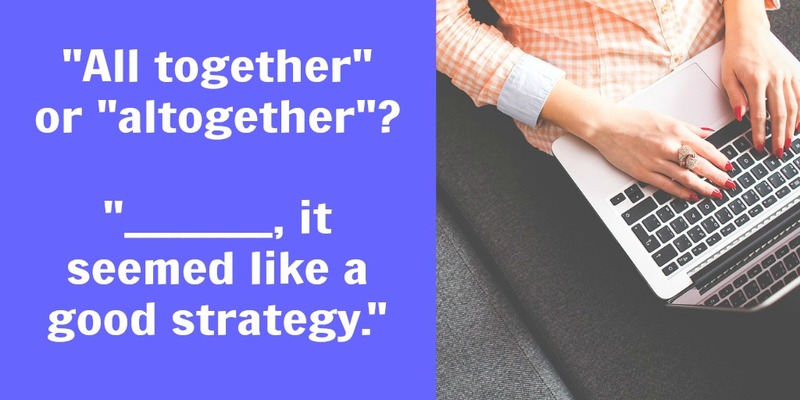 Use all together to say together as a group. And use altogether to say entirely or on the whole. Would you use loathe or loath in this sentence: “I _____ commercial holidays”? Find the answer in our post on the difference between loathe vs. loath.